Here’s a fun rhyming worksheet for kids. Ask your kindergarteners to read the word in the center and then color in the words that rhyme with it. This printable reading worksheet is great for beginners as well as advanced readers, as it includes rhyming words from the same word family as well as rhyming words with different endings. 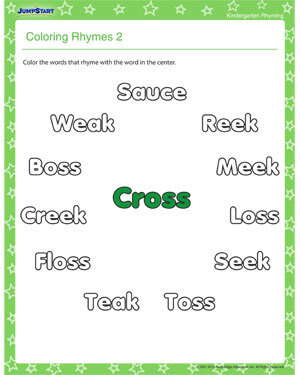 You can also check out the other free rhyming worksheets and reading worksheets for kindergarteners.